Welcome to Sedona Wolf Week 2019! We are so excited to announce the schedule for this year's event which you can view by day or by specific speaker and program. Just like last year, all speaker presentations during the day are FREE. For Apex Protection Project and Plan B to Save Wolves, education is our top priority and we offer these presentations for free so everyone can attend and learn. All Sedona Wolf Week events are ticket-less. When you register online you will receive a receipt of confirmation of your donation and registration. Please check you spam folder. If you do not receive your confirmation please email b@planb.foundation. All attendees for all Wolf Week events must register, sign in and receive a wrist band. If meeting The Ambassador Pack, must also sign a liability release. No outside animals with the exception of service animals are allowed at Wolf Week events. Please send an email to b@planb.foundation if you are bringing a service animal. Refunds for ticketed events will be granted up to 30 days before the date of the ticketed event less a $5 transaction fee. If you cancel and request a refund within 30 days of the ticketed event, a 50% refund will be available. Refunds will not be given after the event. If a ticketed event is cancelled by Sedona Wolf Week, full refunds will be given. For the free speaker presentations (donations appreciated) water, coffee and tea will be available in the room. Otherwise participants are responsible for their own food and beverages which can be purchased at Poco Diablo Resort. 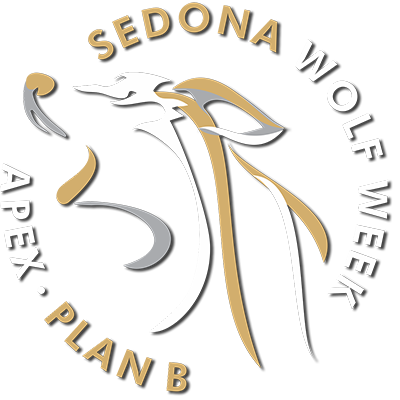 Sedona Wolf Week reserves the right to make changes to the schedule. They also reserve the right to refuse entrance to any event and or have someone removed from any event.